Boat refits can take many sizes, shapes and forms. Refitting a boat can involve mechanical, electrical, and auxiliary systems as well as aesthetics and structural renewals, but most often these projects touch on a part of all of these, and then some. Refit is by definition “to be fit again,” and that can have a different meaning for each boat owner. To some, a refit means an engine(s) repower and mechanical upgrades for greater fuel efficiency and cruising range, or just piece of mind. To others, it means new rigging and sailing hardware to gain the edge on the racecourse. Other refits are designed to equip the boat for safety or comfort. But more often than the not the initial purpose of the refit is to restore and preserve the soul and aesthetics of the vessel for years to come. This often starts with an exterior coatings renewal, either with new gelcoat or paint. For the purposes of this discussion, we’ll highlight the recently completed refit of Alerion Express 28 Hull #1, s/y Moonrise. In 1989, Ralph Schacter of Southport, CT commissioned naval architect Carl Schumacher to design the Alerion Express 28 because he wanted something a little more substantial than the Alerion 26 with a cuddy cabin that offered overnight possibilities for cruising. 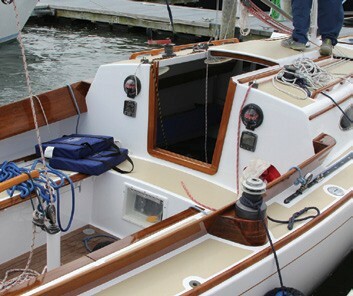 After building about four boats, Schacter sold the mold to TPI in Rhode Island. The Alerion Express 28 quickly became a classic American daysailer, with elegant lines evoking a bygone era while its comfort and speed make it a dream to sail. For her owner, finding and renewing Hull# 1 has evolved organically. After years of competitive racing and big boat ownership with a Santa Cruz 52, he was looking to downsize and simplify his boating life. Although more than 450 Alerion Express 28s have been built, surprisingly there were few on the market. Those didn’t last long, with offers often made and accepted sight unseen, which speaks to the desirability of these boats. After Schacter’s death in 2005, Moonrise was inherited by his son. An avid kiteboarder, the son hoped to bring her to the San Francisco Bay area, but that never happened and after 10 years he put her up for sale. 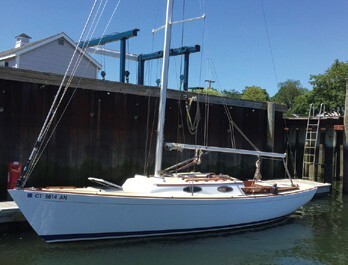 Despite her age, she was in unusually good condition because she’d been kept indoors for all those years at Brewer Stratford Marina in Stratford, CT. Unlike many boats left fallow for that long, Moonrise sat comfortably out of the elements, biding her time. When the family decided that paying storage fees for an unwanted boat no longer made sense, she was listed. Luckily for her new owner, this happened at the right time. After discovering the new listing and seeing the boat an offer was made and accepted. Having some trepidation for purchasing Hull #1 and for an older boat than originally planned, he quickly set about getting up to snuff and finding out if this was a wise purchase or not. This is where my company, Cooley Marine Management (CMM) first became involved with Moonrise and her owner. The owner knew he needed to address several items immediately; the rest could wait until he got a feel for her through a full season. When you decide you’re ready to undertake a major project such as a refit, I strongly recommend that you approach it as such – a major project – during which unexpected items will appear and things won’t go as quickly as you’d planned. Plan for the unexpected! Due to these discoveries and unexpected changes, refits have a tendency to evolve and sometimes end up outside the scope of the original intent. As with any major project, time and money are generally the driving forces. What does your boat need to make your time on the water more enjoyable, efficient and productive? 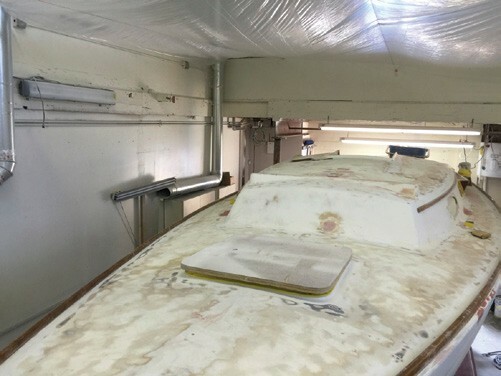 This need is what starts the process, prompting you to make that first call or visit the boatyard to ask about the new engines or who is recommended for fiberglass repairs and painting. At this stage, you should start a list of needs and wants that will become the framework of the project plan. Once the list is in hand, you can start prioritizing items. 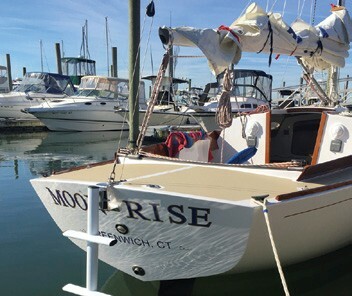 During the first year after Moonrise came out of hibernation, her owner’s objective was to address the systems required to make her an efficient daysailer and club racer: modernizing her rigging and spars, upgrading electronics, renewing her bottom, and some general cosmetics. This was Phase I of the refit. Having brought her to where he could comfortably and safely take her out with family and friends, he began racing in the local weeknight series. She began posting some good finishes, giving her new owner another level of enjoyment and excitement. After that first full season, he brought Moonrise back to Brewer Stratford Marina for inside winter storage…and back to CMM for Phase II. When the owner and I sat down in the fall of 2015 to discuss Phase II, the needs were concentrated on revamping the deck for safety, efficiency and aesthetics. The initial punch list included renewal of several teak planks on the cockpit coaming, repainting the tired nonskid throughout the deck and cockpit, reconfiguring deck hardware to reduce years’ worth of unused blocks and cleats, modernizing others, renewing the varnish, re-fairing the keel, and applying a sprayed coat of BaltoPlate antifouling. With your list in hand, you have several options. You can hand that list off to your preferred service provider and let them take care of it, regardless of cost or project duration. Most people don’t choose that route, because most don’t have unlimited time and funds for their boat. You’d do well to have your service guys come back to you with an estimate for each item on your list. The boat business, in many ways, is still the Wild West when it comes to industry standards. Estimates, for example, come in many forms and can vary widely. Understanding these estimates is essential to grasping the true final cost of a project. Some estimates provide a lump sum price for each task or item requested. These are assumed to include both the labor and materials. An estimate may be broken down into individual costs for labor and materials, while others may provide only the known materials, with labor quoted as a billable hourly rate. No matter what format, always remember that an estimate is just that. Unlike other durable goods, boats vary so dramatically that there’s no one single expert on all. This variation is why estimates are often a service provider’s best guess. That’s not to say that they are not accurate or won’t be honored as final billing figures, but rather from the service provider’s experience and what can be readily seen, felt, the estimate is what is believed to be true. Nonetheless, there is always the understanding that unknown issues lurking below the surface may become abruptly apparent and alter the cost and time of the project. A mutual understanding by service provider and customer is critical in both the planning and execution of the refit. Once Moonrise’s owner handed us his Phase II list, we got to work providing a detailed estimate for the tasks at hand. Our project managers compiled a preliminary schedule of sequential tasks. From this, we broke down the specific items and calculated estimated time (man hours) and materials needed for each. We had a pretty good handle on what we would encounter, and included that in the pricing. However, as in any refit project, there’s always the possibility of unforeseen damage arising once work is started. In those instances, we reserve the right to requote the project as needed. These issues are often minor and don’t have any real impact on the budget, but other times they can be quite costly. Our most important task during the project is to keep the owner as informed as possible, to mitigate the surprise factor when work is complete. These types of discoveries are often exponentially larger the larger the boat is, and are most commonly found during the repainting process. To help offset this discovery, CMM urges clients considering these larger scale projects and where we suspect there may be hidden damages to the substrate, such as a rotten core and/or fiberglass delamination, to have the vessel inspected by an independent surveyor. In areas of question we provide thermal imaging survey. This helps to establish from the onset whether or not there will be discoveries and we then provide at least a budgetary cost estimate to include these repairs as well as known. If the customer chooses to proceed with the work, then the survey is provided at no cost and they have a great baseline for both future work and a potential resale. If the survey indicates damages beyond the intended budget, or if repair costs will exceed the value of the boat, the owner can choose not to proceed with the work and simply pays for the cost of the survey. The final major influencer of refit evolution is time. Time, to many of us, is the single greatest commodity in the world, and when it comes to our boats, it’s all about time. Here in the Northeast, most of us are limited to enjoying our time on the water to half the year, so it’s imperative that the off-season is utilized for refits and other major repair projects. With this mindset, forethought and planning become your best tools for successfully completing the refit. 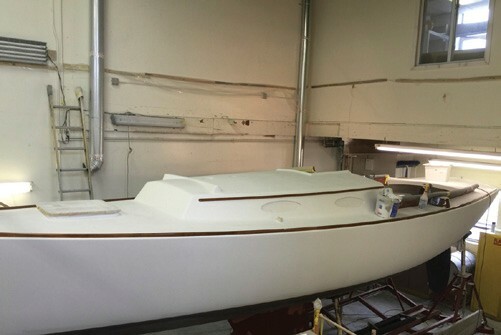 In boat repair and refit work, many processes are sequential in nature and dictated by limited physical access and specific product curing and drying times. Therefore, understanding the scope and intent of a project before starting is critical to gauging its duration. With Moonrise, our original schedule (combined with our other work) had us completing the refit in about two months. The first phase was to have the keel media blasted to remove all of the old damaged fairing and to provide a nice profile to build on. As it happened, we had several snowstorms the week we’d scheduled for the blast, and that delayed the project right from the start. Once the boat was back inside, we had several meetings with the owner to discuss such details as nonskid colors and paint blend lines. During one of these meetings we discussed the feasibility of carrying the deck paint down and including the hull. Once that subject was starting to be explored, the question of restoring the remaining exterior wood was posed as a full paint job gave the best opportunity to start over with the wood. We put together a revised schedule and budget for the owner to consider. At this point it was already mid-February and on paper, the revised plan had us completing right as everyone wants to be launching in April. With the revised numbers and timeframe in hand, the owner decided to move forward with the full exterior refit. 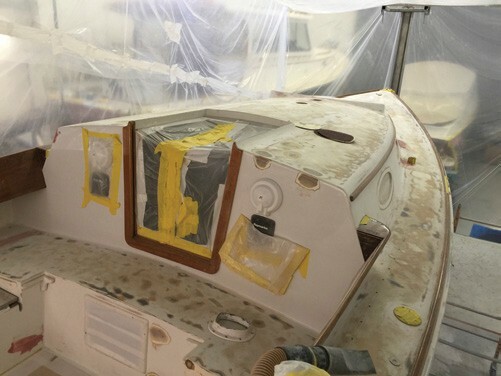 This included a complete respray of hull and deck, new nonskid with a new layout to incorporate the revised hardware placement, and full teak restoration in addition to the previously planned keel fairing and bottom paint. Once we’d settled on price and schedule the guys dove right in, fully stripping the boat, sanding and prepping for the first stages. To accurately coordinate both manpower and materials, our project management team creates a detailed MS Project Gantt Chart that serves as a framework to both predict major milestones and the projected completion schedule, while giving the guys on the floor and management a tool to judge our progress. With the dramatic changes to the Moonrise project, the schedule increased to an estimated 10-12 weeks. We initially focused on getting the entire boat ready for primer. To do this properly, all hardware was removed from the exterior surfaces. Once an item was removed it was identified to be reused, replaced or eliminated, then catalogued and stored. Using our revised deck layout plans, our fiberglass techs filled any unused or altered hardware mounting holes. To ensure these repairs would never be visible, especially through the shiny new topcoat, each repair was filled with an epoxy resin and fiberglassed if needed, coated with epoxy fairing compound, sanded to the match the existing area, overcoated with High Build Primer, and again coated with finishing primer. After sanding the entire deck down, we noticed considerable highs and lows, particularly where the nonskid had been, so we decided to coat the entire deck surface with a full high build primer. This decision added approximately a week to the project; but was deemed necessary to ensure the high quality finish the owner envisioned. The next phase was the brightwork. The chosen system required that all the wood be completely stripped of its existing varnish, sanded and thoroughly cleaned. Two coats of clear primer were applied to the bare wood, followed by 10 brushed coats of Awlwood Clear Coat. After our wood finish had been properly built up, we started the various topcoat paint shoots on the previously primed surfaces. 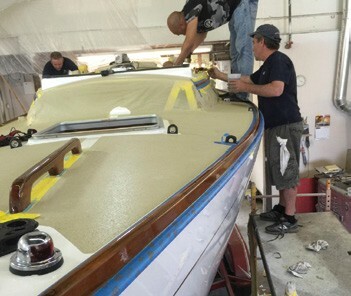 On most projects, we prefer to work from the top down, and we started with the deck and house paint shoots and working our way down to the hull and bottom. Once the gloss paint was shot, we installed all the new deck hardware and created the new nonskid patterns. Leaving the area around the hardware high gloss helps with bedding the hardware securely and allows for easier cleaning when the boat is back in use. Since Moonrise never had this feature, we spent a great deal of time and effort to ensure the patterns were consistent and aesthetically pleasing. Finally, we sprayed two more coats on all of the wood. As the final paint phases were nearly complete, the owner threw us a curveball. The builder of the Alerion is now outfitting new models with a bracket designed to accept a swim ladder that also serves as the mount for the backstay, and he wanted this feature. When we received the stainless fitting from the builder, we discovered that Hull #1 did not have the same geometry as newer hulls. We opted to slightly modify and reinforce the transom. This involved beefing up the balsa-cored transom by laminating G10 in place of the core. This in turn, needed to be adequately bonded, faired, the bracket fitted and the transom resprayed. Andrew Cooley is the owner of Cooley Marine Management, LLC in Stratford, CT. With a background in marine repair and project management, he is well versed in both new construction and refits. To learn more about CMM’s repair, refit, project management, consulting and marine general contracting services, visit www.cooleymarine.com.